Since many years studies of the metal-atmosphere interface and reactions taking place in this interface take up a big part of research as it is of interest not only from fundamental but also technical perspective. As metal and metal oxide surfaces play an important role in numerous naturally but also technically occuring processes, such as catalysis or atmospheric corrosion, researchers are eager to gain improved knowledge. The characterization of these reactions occuring during atmospheric corrosion processes at the metal-atmosphere interface is crucial as only the exact knowledge of the degradation mechanisms enables the development of adequate corrosion inhibiting steps. 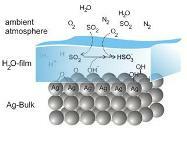 The aim of this review is to consider the potential and applicability of sub-monolayer sensitive in-situ techniques to investigate the influence of humidity, acidifying gases and UV-light on the initial atmospheric corrosion of silver.